Forget about dreaming of seeing Pamela Anderson in her trademark red swimsuit on the beach; there’s someone else we would rather greet, and he even carries treats with him. We are talking about KFC’s Colonel Sanders, who looked cooler than James Bond as he arrived in a huge KFC yacht to Dubai and jet skied to Kite Beach surrounded by his equally cool crew. 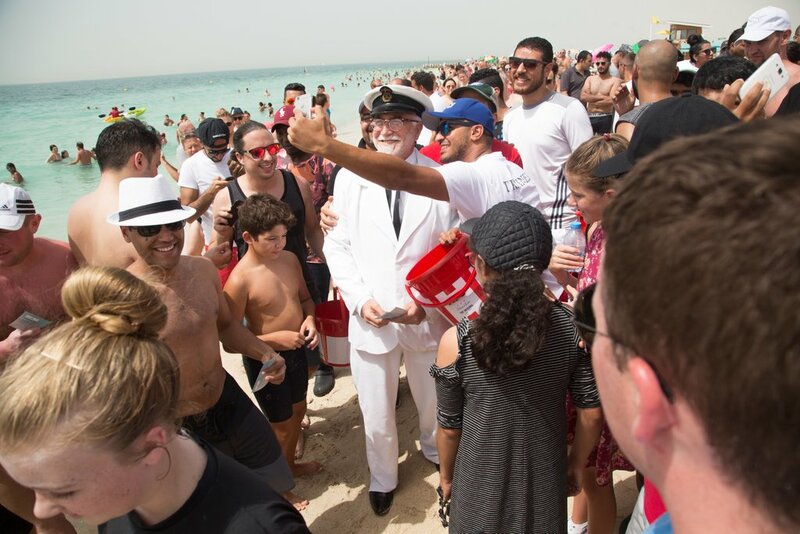 The man dressed as KFC’s founder - American businessman Colonel Harland David Sanders - greeted an excited crowd, whom he took selfies with, before presenting them with some deep-fried delights. The PR stunt was part of the fast food chain’s promotional campaign for their new limited-edition Zinger shrimp menu. You can try the Colonel’s new creations at KFC stores in Jordan, Lebanon, Egypt and the GCC.